binners by hanging bottles, cans, and other objects of value in bags for easy and safe pick-ups. T​his simple act acknowledges the contribution that binners make to communities, supports their economic stability, and adds dignity to their work. A hook costs $20. Purchase here. You may opt-in to have your Binners Hook installed by a Binner, or install it yourself. We have expanded the Binners Hook program in partnership with Calgary Can and Coop Les Valoristes. Our partners at Calgary Can have piloted the Binners Hook program in their Hillhurst/Sunnyside neighbourhood with 20 hooks made in Vancouver. We're excited to watch this program develop and expand in Calgary. 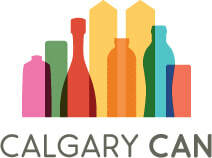 You can find more about Calgary Can's Hook program here. In collaboration with Coop Les Valoristes, Regroupement des éco-quartiers​, and Société de Développement Social, the Hook program expanded to Montreal. These three groups worked together to create a new hook that best suited the needs of Montreal binners, or valoristes, and residents. To find out more about La Consigne J'accroche click here. How much does a Binners Hook cost? A Binners' Hook is $20. Hooks are locally designed by Basic Design and produced by Metal Mart. What is the Binners Hook made of? Hooks are made from high-grade stainless steel that will withstand the rainy Vancouver elements without rusting or damaging your property. We've been working hard with the folks from Basic Design to ensure that this hook is created in such a way that it will hold bulky and/or heavy bags without sagging or even breaking due to the weight. Where can I install my Binners Hook? We recommend that you install your Binners Hook in your back lanes, where it is most accessible by local binners. City by-laws restrict placing Binners Hooks on City property including telephone poles, City-owned garbage bins, and more. If you have further questions, you are welcome to contact us at info@binnersproject.org. When can I expect my Binners Hook? We currently offer three ways to get your Binners Hook (see above). If you chose shipping or delivery + installation, you can expect to receive your Hook within 1-2 weeks after you place your order. Who is coming to install my Binners Hook? If you select the delivery + installation, a participating binner from Vancouver contracted by the Binners’ Project will call you to schedule a time for your installation within the two weeks following your order. Where is the $20 delivery + installation surcharge going? Why do I have to pay in cash? The $20 delivery and installation charge goes directly to the binner installing your Binners' Hook. We are not collecting this fee on our online payment system. We ask that you pay the binner coming for installation $20 in cash. Please keep in mind that the binners might not carry change. Contact us at info@binnersproject.org if you have further questions. The Binners Hook was designed by Shane Frei and manufactured by Metal Mart.